When Richard Van As, a master carpenter in Johannesburg, South Africa, decided to make a set of mechanical fingers, it wasn’t just for fun. He’d lost four of the fingers on his right hand in an unfortunate work accident. For a tradesman like Rich, having a disabled hand is a big professional detriment, so Richard decided on the day of his the incident that he would use the tools available to him to remedy his situation. Watch the inspiring video above to hear how Richard’s project, Robohand, is changing lives with patience, spirit, and a MakerBot Replicator 2. MakerBot heard about the Robohand project in January 2013. Richard had been trading ideas with Ivan Owen, a collaborator in Washington State, for several months. Ivan used his prior experience with mechanical prop hands to make design suggestions, while Richard attempted to replicate the designs in his workshop. The process was taking weeks and months per cycle. For us here at MakerBot, that was too much wasted time. We knew our 3D printer, the MakerBot Replicator 2, could take this important work to new heights. 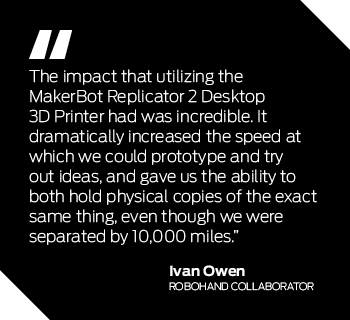 We saw their collaboration and the work they were doing as groundbreaking, and we asked Ivan and Richard to accept a donation from us: a MakerBot Replicator 2 for each of them, one in Washington, and another in South Africa. If the tool was useful to them, we hoped they would share their work on Thingiverse.com for the world to download. It turns out the MakerBots were incredibly useful, and the guys have followed through on their promise. Just hours after they received their packages from us here in Brooklyn, the two collaborators were sharing files back and forth, testing the design in one place and doing another iteration on the other side of the world. Richard says it took the prototyping process down from weeks to just 20 minutes. But that’s only half the story. Robohand has grown far beyond the goal of making a set of fingers just for Richard. When the power of desktop 3D printing and MakerBot entered the picture, Richard began to realize how quickly he could refine a design for other people who have lost their fingers, or who were born without fingers. After posting his own story, he received emails and Facebook messages from parents whose children were candidates for a Robohand of their own. One of these children was five-year-old Liam. The condition Amniotic Band Syndrome is poorly understood, but the effects of it are pretty clear. Children are often born without extremities, especially fingers and toes, when fibrous bands in the womb prevent these parts from developing normally. It’s this condition that caused Liam to be born with no fingers on his right hand. The cost of purchasing a traditional prosthesis was far too much for the family, especially since Liam is a young and fast growing boy who would outgrow a prosthesis in a few months. Liam was given a Robohand just days after Richard and Ivan received their MakerBots in January, 2013, and he has already been fitted for his second. The word spread, and other kids in the Johannesburg area like Liam with Amniotic Band Syndrome have received their own Robohands, sized just for them. The files, including the assembly instructions, have been posted online at Thingiverse, and they have been downloaded over 3,800 times by people around the globe. A Robohand is a set of mechanical fingers that open and close to grasp things based on the motion of the wrist. When the wrist folds and contracts, the cables attaching the fingers to the base structure cause the fingers to curl. Nearly all the parts of a Robohand are 3D printed on MakerBot Replicator 2 Desktop 3D printers. Ivan, who played a big part in the initial design stages of Robohand, says he studied the anatomy of crab legs and human fingers to get the basic muscle and tendon structure. The result is a simple assembly that Richard believes anyone can make themselves. While a full set of prosthetic fingers may cost thousands of dollars, all of the Robohand parts that are made on the MakerBot Replicator 2 add up to roughly a few dollars in material cost, with the total mechanical hand costing around $150 (USD). Amniotic Band Syndrome affects 1 in 1,200 live births. About 80% of cases of Amniotic Band Syndrome involve the loss or malformation of fingers and hands. Finger amputations are the most common amputation in the US, accounting for over 90% of all amputations, according to various reports. How Do I Get A Robohand? Robohand was not imagined as a service or a product. Instead, Richard has shared the design files and instructions for creating a Robohand on Thingiverse so that people around the world can download, customize, print, and assemble Robohands for themselves or for others. So far, we’ve heard stories of Robohands being made for children and adults in the US, Canada, and Thailand. Are you a MakerBot owner who can give this incredible gift to someone in your community? There’s still a lot to be done. Richard has given hands-on help to a few of the people within his reach, but Robohand needs your help in order to get to the people who need it most. ● Want to spread the word? Share this video with your friends on Twitter or Facebook. ● Looking to to support the cause? Check out Robohand’s Indiegogo campaign. ● Are you an occupational therapist or prosthetist? Leave a comment below! The full bill of materials is listed here.